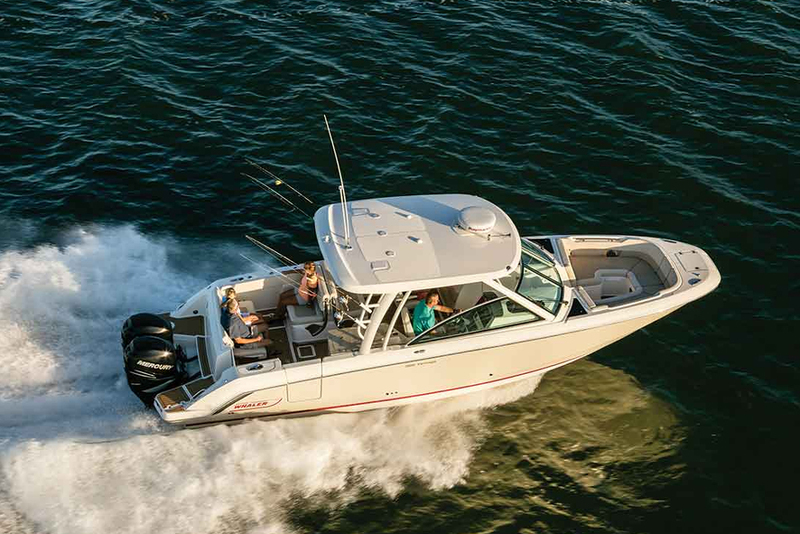 The 2019 Boston Whaler 320 Vantage is a do-anything boat with some serious beef. When it comes to maximizing versatility, it’s tough to beat the dual console design. Very tough. 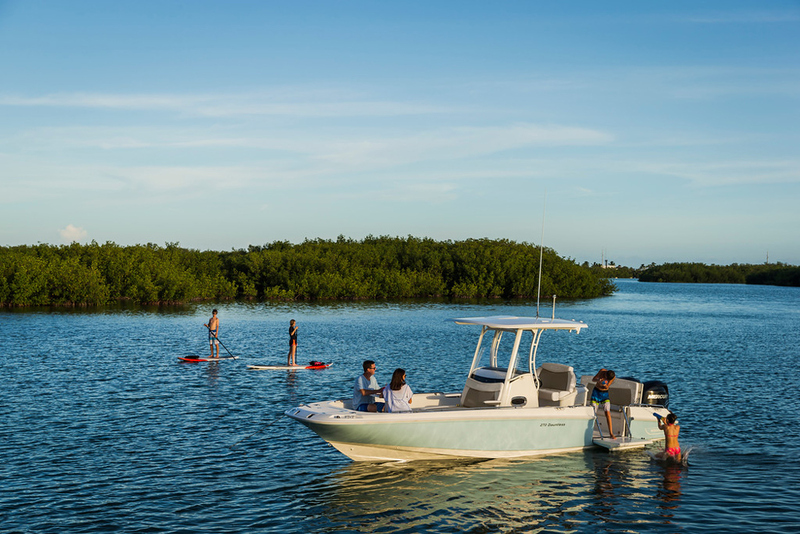 Case in point: the 2019 Boston Whaler 320 Vantage. But before we start digging into the details, let’s take a look at what happened when we spent an afternoon reviewing this boat on video. 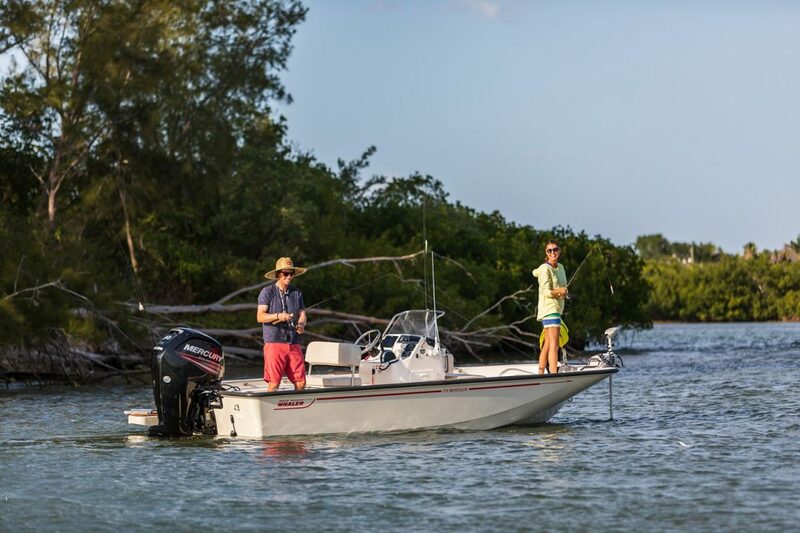 When Boston Whaler first introduced the Vantage series in 2012, it consisted of two models, a 23 and a 27. 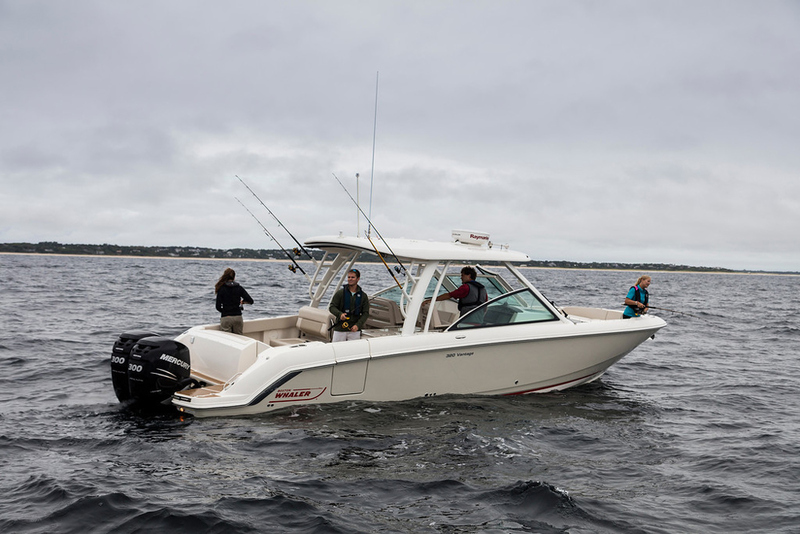 We spent some time on them then (and shot a 230 Vantage First Look Video), and then later Whaler added the 320 Vantage to the line-up, which we also checked out (see 2017 Boston Whaler 320 Vantage Review). 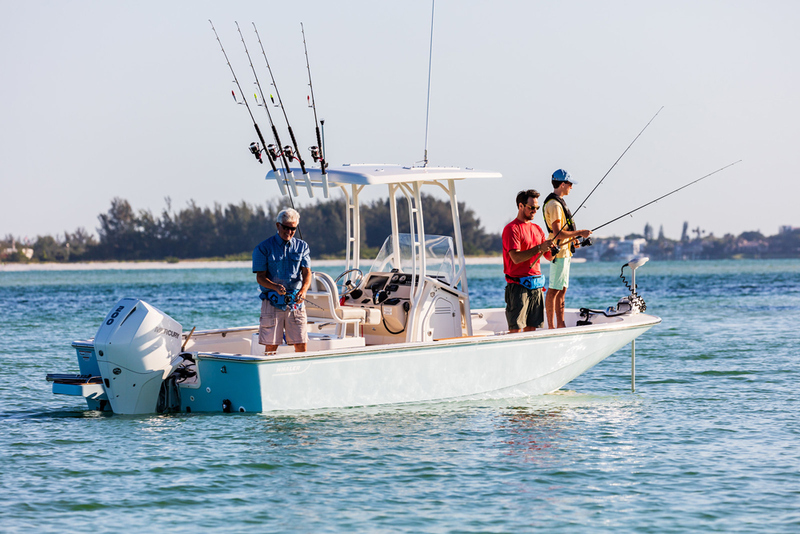 Through it all and right up until the moment we stepped off the 2019 model, one thing about this line has always been abundantly clear: it will satisfy both anglers, and family boaters. True, die-hard fishermen would opt for a center console. Yes, those interested purely in watersports will choose a watersports boat. Of course, people who plan to spend all their time overnight cruising will want something with a bigger cabin. But if you want a boat that can do all of the above and then some, the 320 Vantage fits the bill. As far as angling goes, like all Whalers, the 320 Vantage comes stock with a good number of features right out of the box. The gunwales house four flush-mount rodholders, there are four more in the transom, the hard top sports four rocket launchers, insulated in-deck and under-seat compartments provide plenty of places to ice down the catch, and there’s an 18-gallon livewell. Notable options you may want to add include a raw water washdown and the delux prep center, which gets you a 40 gallon livewell with a prep station and tackle stowage. 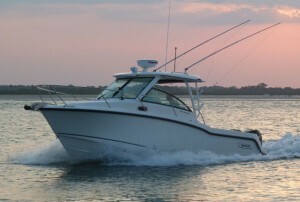 The 320 Vantage retains 80 or 90 percent of the fishability you’d get in a center console. The aft cockpit is fairly open and thoroughly fishable, as long as you don’t start cluttering it up with accessories like the aft dinette table. Trollers and chummers will find it more or less like fishing from any boat that has a hard top or a cabin forward of the helm. Anglers who enjoy casting or drift fishing will be able to take advantage of the bow to some degree, though this portion of the boat is clearly tilted more towards seating and comfort. Still, one angler can take up a forward position and do their best to add to the catch. 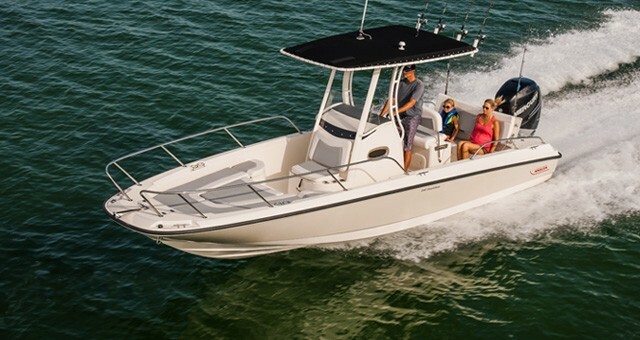 The one big down-side as compared to a center console is, of course, the loss of 360-degree fishability around the boat. A tow bit on the hard top, among other things, can enhance the 320 Vantage’s watersports abilities. The 320 isn’t just a multi-tasking boat, it’s a big one, too—very big, when it comes to watersports. Still, you can have it outfitted with an elevated tow bit on the hard top, so catching serious air on that wakeboard or water skis won’t be a problem. Another fun feature you can add is an onboard air compressor for inflating tow-toys. A bow-mounted fold-away beach boarding ladder, starboard-side dive door with removable dive ladder, and freshwater showers both forward and aft round out the accouterments that make watersports not just possible, but highly appropriate despite the boat’s size. The versatility continues in the cockpit, which you can also customize to a degree. The boat we were on during our recent review had that big deluxe prep center with livewell, which is a fantastic option for the fisherman. 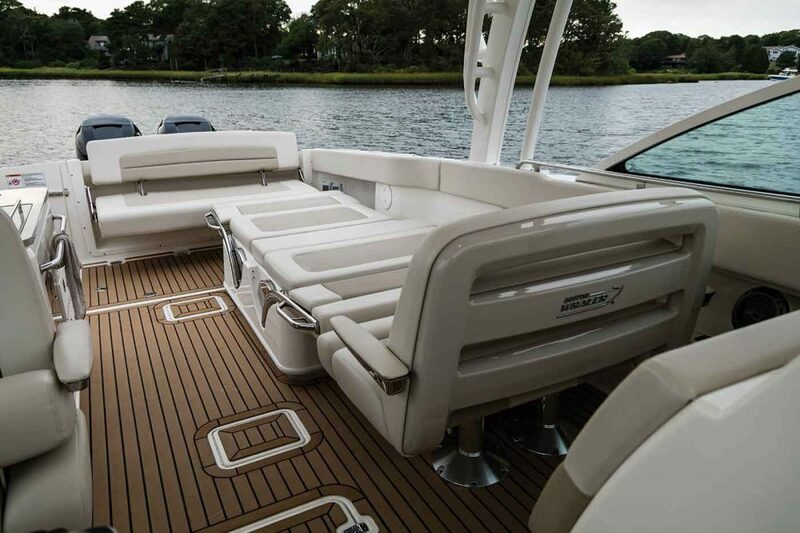 The standard configuration for this boat is equipped with an aft-facing lounger. And Whaler spaces the aft bench and forward seat such that when you flip down the backrests of the loungers, you end up with one gigantic sunpad. Opt for the aft-facing lounger in the cockpit, one of the most popular arrangements on the Vantage, and you can transform a huge portion of the boat into a massive sunpad. Wait a sec – isn’t calling a dual console boat a “cruiser” beyond all reason? Once upon a time, maybe. But the 2019 320 Vantage has a cabin with a settee that converts into a berth inside the passenger’s side console. No, it’s not huge, but it’s certainly sufficient for a couple spending the night on the hook. And inside the starboard-side console, there’s a stand-up head compartment. 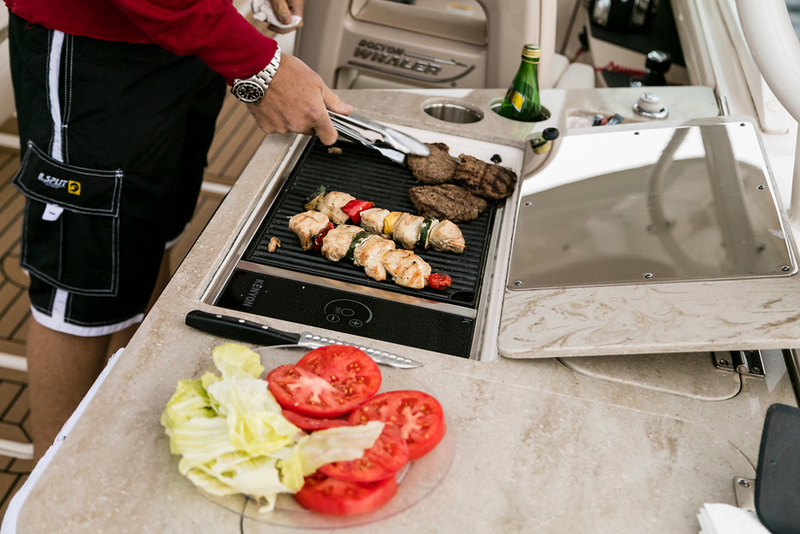 The amount of cabin space doesn’t allow for a galley, but as is the case on many modern cruisers, there are al fresco food prep options. Aft of the helm there’s a “Cockpit Utility Center,” which on most boats would be called a wet bar. It has a cutting board, stowage drawers, a trash receptacle, a sink with pull-out sprayer, and an 18 gallon cooler (which doubles as a livewell). You can opt to add an electric grill and a refrigerator. As for the actual act of cruising, the Vantage is not going to disappoint. 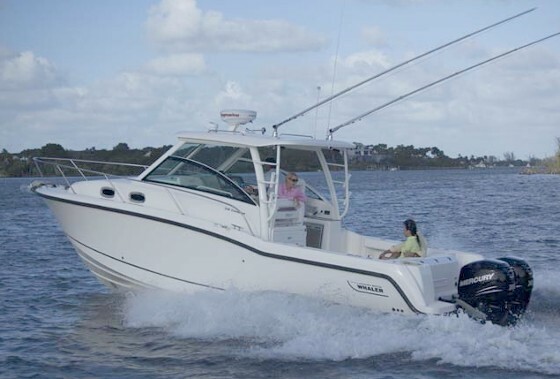 Our test boat sported a pair of Mercury Verado 350 outboards, the maximum power option for this model. They shot us up to a top-end of over 50 MPH – 51.8 to be exact – and provided a 4500 RPM cruising speed in the mid-30s while getting a hair over one mile to the gallon. With a fuel capacity of 285 gallons, that means you can cruise to ports over 250 miles away while retaining a 10-percent fuel reserve. Should you get the grill? Ummm… this is what we call a no-brainer, folks. Complaints? It’s tough to come up with any, excepting perhaps the boat’s cost. Starting at around $300K the 320 Vantage represents a rather serious investment, though we’d also note that as usual, you get what you pay for. 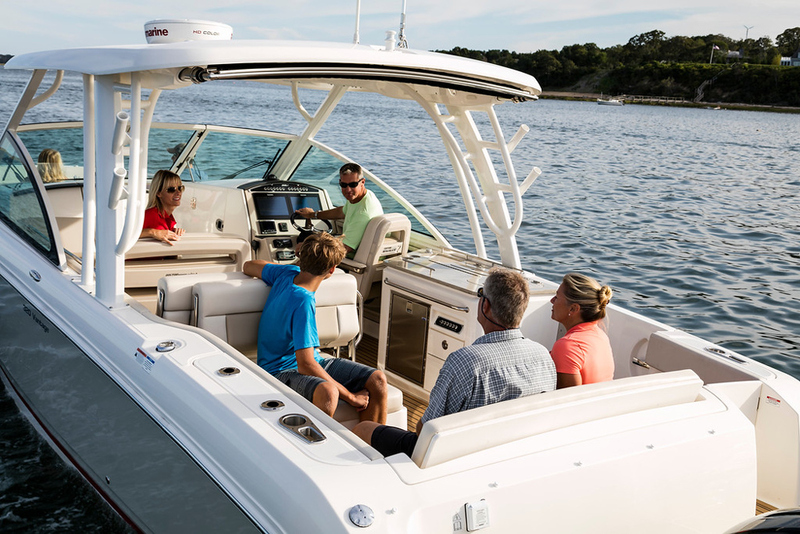 The boat is built with Whaler’s epic unsinkable glass-foam-glass construction method, and all of its fittings and accessories are just as heavily-built. Also, remember that Whalers as a rule tend to hold their resale value far better than most competing boats. So in the long run, you get more of your investment back. Then again, who really wants to dwell on finances, when there’s all that fishing, wakeboarding, and cruising to think about? Other Choices: Another bodacious dual console to check out is the Grady-White Freedom 335. The Pursuit DC 325 also has similar attributes. 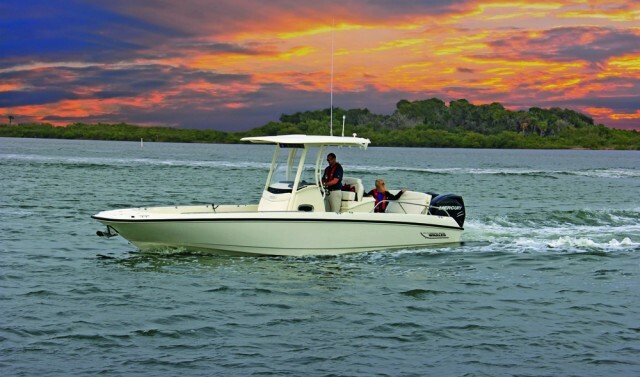 See Boston Whaler 320 Vantage listings.